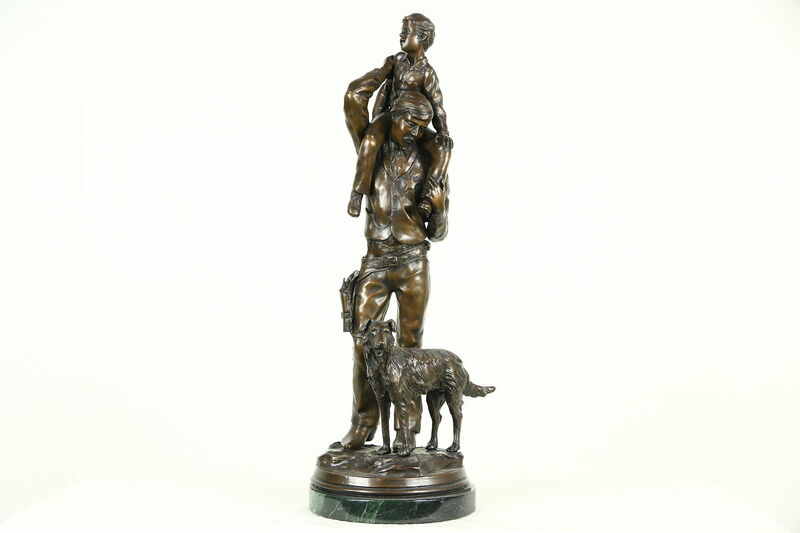 "Going Home" is a bronze statue of a sheriff with his dog, carrying his son on his shoulders. The base is signed "Stan Johnson, c. 1985, 3 of 50" and bears the foundry mark as well. Stanley Quentin Johnson is a noted American artist, born in 1939. Iconic figures are very natural and capture a leisurely pace in this work of art. There is a hairline crack on the back of one leg of this sculpture, see photos. The base is green marble, there is a repaired chip on one side as shown. See 22 photos on that enlarge to full screen size.